Dammam to Jeddah on A330 in economy class, connecting in Jeddah to London Heathrow on Boeing 777-300 in economy class. Check-in at Dammam International airport. The building has an almost museum like feel to it, grand and in the old 70’s USA airport style – all polished marble, grand pillars, gushing water fountains and metal flower pots. Saudia is the home-carrier for Saudia Arabia and spreads itself between Dammam, Riyadh and Madinah Internationally, though Jeddah remains its strategic hub. As such, to get to London today it’ll be a 2-hour domestic hop across the Empty Quarter to connect into SV115. The staff service this morning is so bad as to be almost comical. A lethargic Saudi Ground Service agent can barely muster the energy to raise his head from a music video blaring out on his smartphone. The service is almost totally wordless and speaks of zero concern or regard for customer service and enthusiasm, and now reflecting on it, has almost a veneer disdain to it. It is an extremely poor introduction to the airline. As with almost any flight in and out of Jeddah, you are likely to be among some Hajj travellers or other pilgrims. This domestic flight is no different. 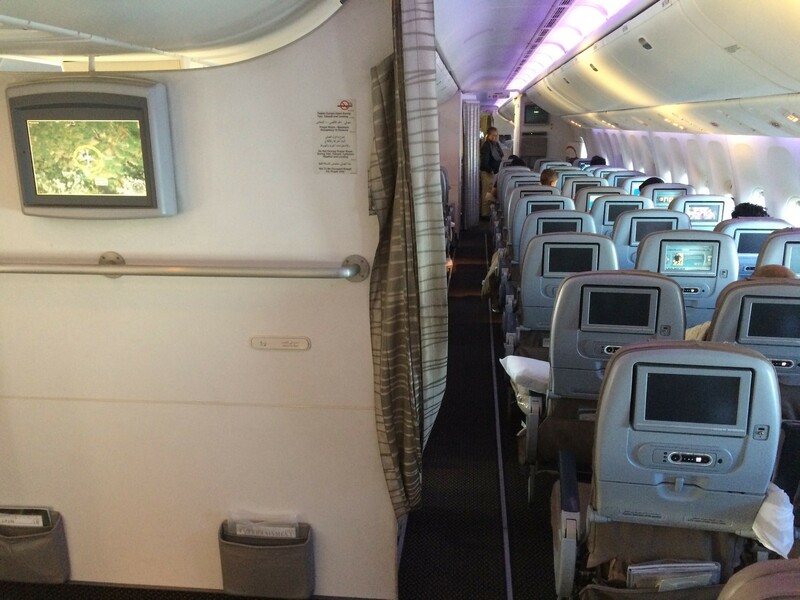 An unexceptional flight on an A330-300 with plenty of room to spread out, and comfortable seating. The full IFE system is available onboard, though headphones are not given out. The catering consists of (after five domestic flights in this trip) a ubiquitous cheese sandwich or a cake, with juices and coffee. The crew were helpful and patient on this morning’s flight and they oblige when I ask for a pillow and blanket. 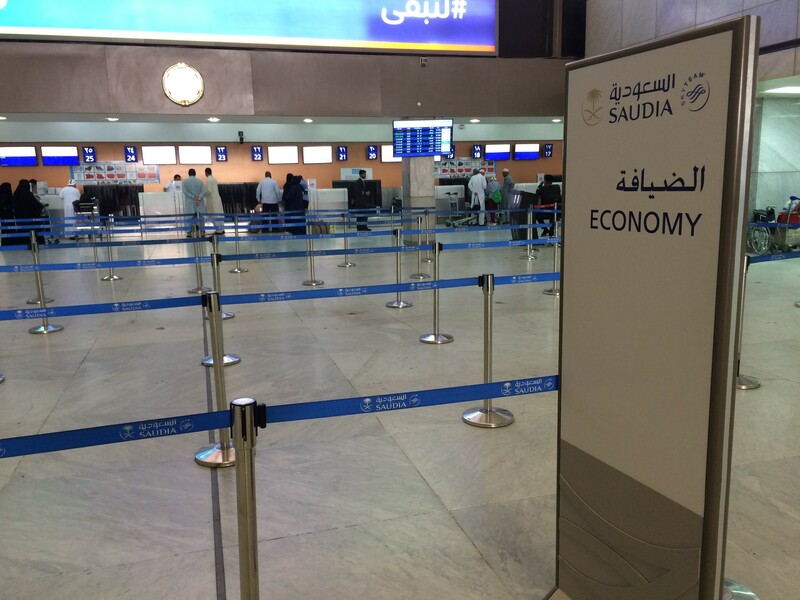 Saudia’s domestic and International operations are based at the South Terminal. This is an overcrowded, dated, dirty and quite chaotic little terminal. This is all set to change in the next year or so, with all flights being phased over to the enormous Terminal 1. This will improve the convenience for customers transferring at Jeddah as well as offering an overhaul in the passenger experience. But, for now it’s still the South Terminal and a heavily delayed Lahore flight has made the departures hall feel like a bazaar and tempers are heated. Boarding begins early, with a secondary security check for London and US bound flights. All flights are from remote stands which involves a short bus journey and hints at the savage Saudi heat. The upside of this inconvenience is being able to board the plane by stairs and admire the sheer size of the Boeing 777-300ER in the 45 degree blazing sun. Saudia offers a generous baggage allowance even on the lower fare tiers of 23kg checked in luggage and 9kg of cabin baggage. Two items may be checked-in. In reality, some customers are assumed to have hand luggage much heavier than this given the struggles to get these items in the overhead bins. The flight is operated on a slightly older version of the Boeing 777-300ER which does not feature the newest Business class seat. This does not perturb me too much given I am flying in the back cabin and the seats themselves in Economy are just as comfortable and spacious between the new and old versions of the 77W. The main difference for the older seat is a lower quality IFE system (smaller screen and slow response) and the lack of electric power. It does have a USB charger however. The seat reclines generously in a cradle motion, thus not disturbing those behind you too greatly. The upholstery is pastel beige leather and the cushioning is excellent. Headrest adjustment is good and there are paddle footrests for all customers. The headrest is leather. If you look a little closer around the seats and in the washroom, you’ll see that the aircraft is very dirty and rarely sees a strong deep clean. This is the only part of the hard product that is a letdown. Of note on Saudia is a large open space at the rear of the aircraft in the centre of the aircraft which is for prayer during the flight although I am yet to see it being actively used on any flight. Saudia does seem to be having some issues with maintaining their aircraft. The in-cabin cleanliness is really below the correct standard, especially around the floor areas and in the washrooms. These could be much better maintained, and it is unfortunate as they let down what are very spacious and well-upholstered aircraft. Drinks service starts quite quickly after take-off. Shelve those plans for a G&T above the clouds, as Saudia is a dry airline and does not serve any alcohol onboard. However, the juices are high quality. 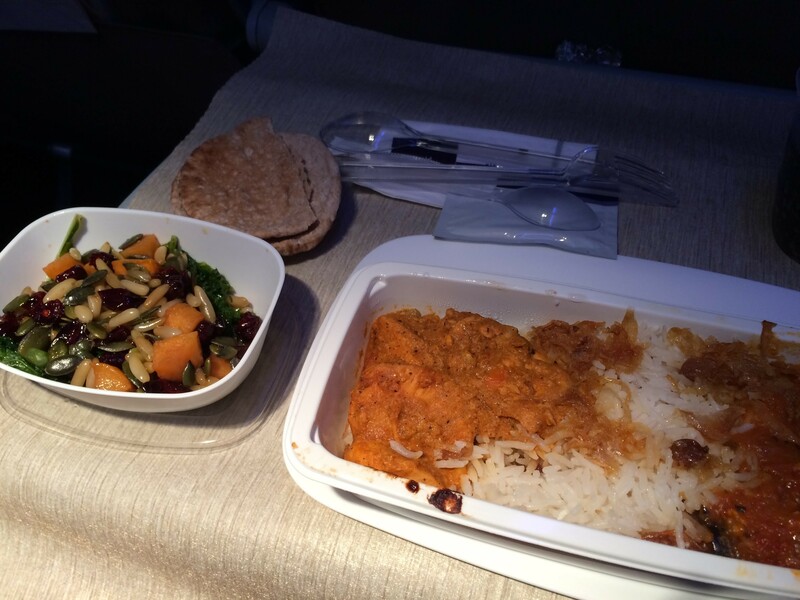 The meal onboard todays flight is very different from the typical tray-based meal service observed on almost all Economy Class flights. The service commences an hour after take-off and each table is laid with a sand-coloured synthetic tablecloth. Then the main course is offered on a small serving plate. In addition to this the appetiser, bread and dessert are laid out on the table. This type of service makes it feel much more personalised and makes a good impression. The choices today are between a local chicken khabsa, and a Red Sea pasta dish. Given the quiet flight, I ask to try both. The quality of the meals is quite good although there are faults with each. The khabsa is really mislabeled and is much closer to a chicken curry in flavour and look, whilst the Red Sea pasta is overcooked and stodgy. But each have a degree of appeal and are satisfying on the whole. The appetiser is a healthy salad, whilst the dessert is large and calorific. Quite an appealing custard crumble type affair. What is most impressive is the attention paid by the crew, who take time to ask which option I had preferred. The pace set for the service was also good with limited waiting around. 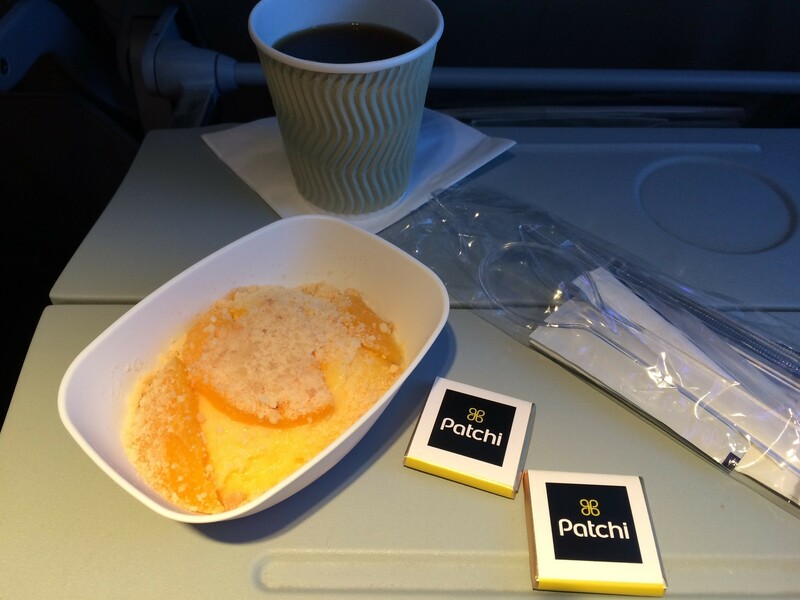 During the cruise section of the flight, no snacks are available in galleys. After a short nap, I wake up to find that a select few customers are nibbling on snacks. Had I missed it? I ping the call button and double check, and the reply is a bit vague. Eventually they bring me a cereal bar. Peering over my seat, I notice that my more favoured fellow flyers have chocolate biscuits, mini-Crositinis from Italy and the same cereal bar, so it is assumed there is a good choice, but it is offered in a very ad-hoc way that is easy to miss as a customer. Among the more curious things onboard is a bulkhead video that screens for the first half an hour. It is a junket for the Vision 2030 initiative that has created much hubbub among Saudi people. This ostensibly means bringing Saudi Arabia out of the shadows and creating a more sustainable economy that does not rely entirely on oil. The climax of the video is a cleaning display in the Holiest Mosque in all the land, with various sweepers – manual and machines, creating the cleaning equivalent of a synchronised swimming routine complete with go-pro mounted brooms. Back to the personal systems, and this is seatback individual IFE. On demand from boarding, one annoyance is that they disable the system almost immediately after landing. The content is excellent and contains over 300 movies, multiples box sets and TV shows in addition to 35 games. 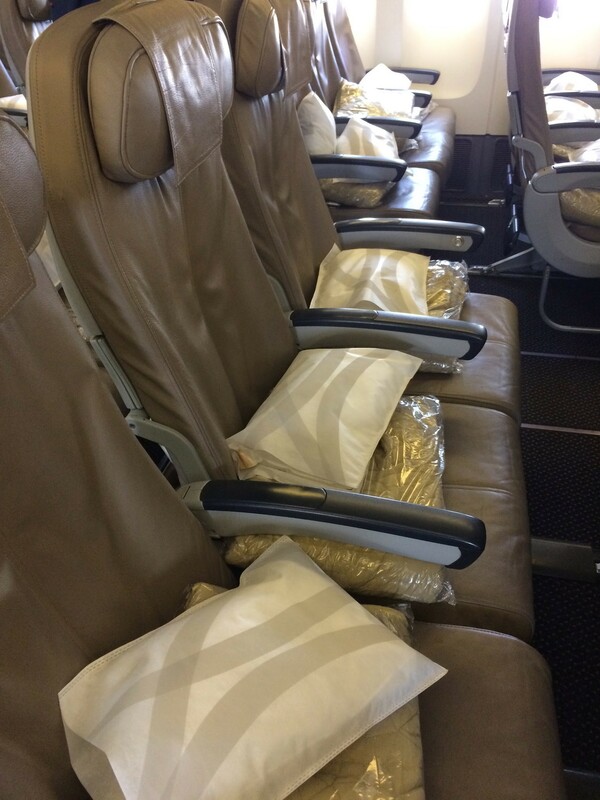 So, customers should never run out of entertainment onboard a Saudia flight. The content includes latest blockbusters, although there is quite a high degree of overzealous airbrushing which can make films such as Wonder Woman or Fast and the Furious rather tedious. There is even a special Tom Hanks category in the film choices. 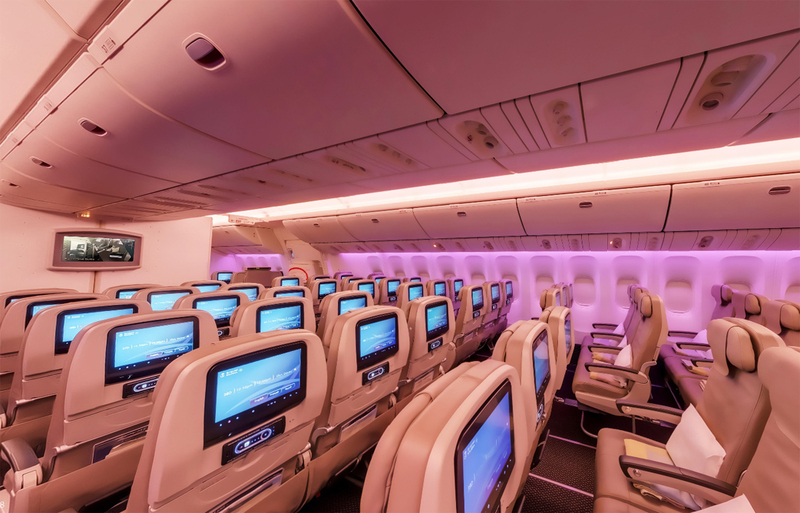 A good IFE guide is provided, although the content is renewed every two months meaning that towards the end of that period it is lacking a competitive edge in terms of the latest movies. On some of Saudia’s new 777, the aircraft have cameras of such high definition that you can see the content of the mobile phone screen of the aircraft dispatcher on the ground, however this older aircraft’s camera looks like a barely focused fuzz against incandescence. There is a much stronger service process onboard this day flight, with a hot, spearmint-smelling towel given out on the ground, in addition to a nicely finished menu and headphones. The headphones are in-ear and customers may keep these. The contents of the menu give me a positive feeling of anticipation for the meal service. A 200ml bottle of water is given out after 10 minutes. 200ml seems a thrifty and wasteful amount to give out on a 6-hour flight. For me that is but a gulp. Cold juices were also given out at irregular intervals. The crew onboard today’s flight rated very favourably in terms of friendliness and attentiveness. The first impression after boarding is very positive, and the crew is quite multicultural onboard. This mostly stems from the female staff, who hail from a variety of countries. The male crew tend to be all Saudi citizens. The Saudi gentleman serving my section was particularly obliging and helpful, and keen to engage with each customer where appropriate. Some of the non-Saudi crew were a little less smiley and positive in their approach to cabin duties. The crew onboard dedicated more time to being in the cabin than outbound crew, and appeared to enjoy parts of the service. Overall the impression was positive. Saudia lacks polish when it comes to ground service and the airport experience, but hopefully the culture is set to change when they move into their new terminal at Jeddah. Up in the air however, Saudia provide an excellent, spacious and appealing product which is generous in legroom and comfort. The food is fine and the staff have moments of genuine warmth and engagement with customers. They are patient with infrequent travellers and efficient in their various duties.